Pipe dream, originally uploaded by LotusGem. I don't know which category of photography this falls under. But I'm guessing abstract is probably the closest. A pipe dream is a fantastic hope or plan that is generally regarded as being nearly impossible to achieve. The term derives from the opium pipe, and dates to the late nineteenth century when opium smoking was common in the United States. More specifically, the term derives from the euphoric optimism that is one of the effects of smoking high quality opium. Depending on how much opium is smoked, intoxication may last from eight to twelve hours. During this time smokers go through a period of euphoria followed by a more relaxed state of contentment and well being. Beginning in the late nineteenth and early twentieth centuries, popular literature and music began using the term "pipe dream" to describe any idea or plan whose probable outcome would never reach initial expectations. Why did you call it "Pipe dream"? I guess, because of all the pipes? 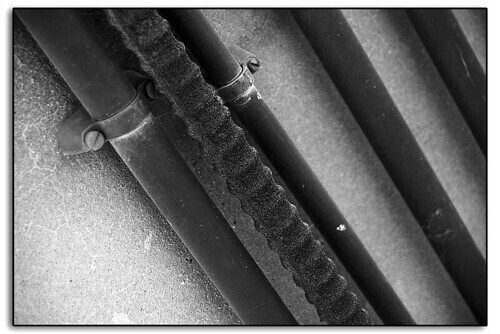 I really like the border on the photo, but honestly, I don't "feel" anything.. perhaps I worked with pipes too often, hehe. I've updated the post for you.